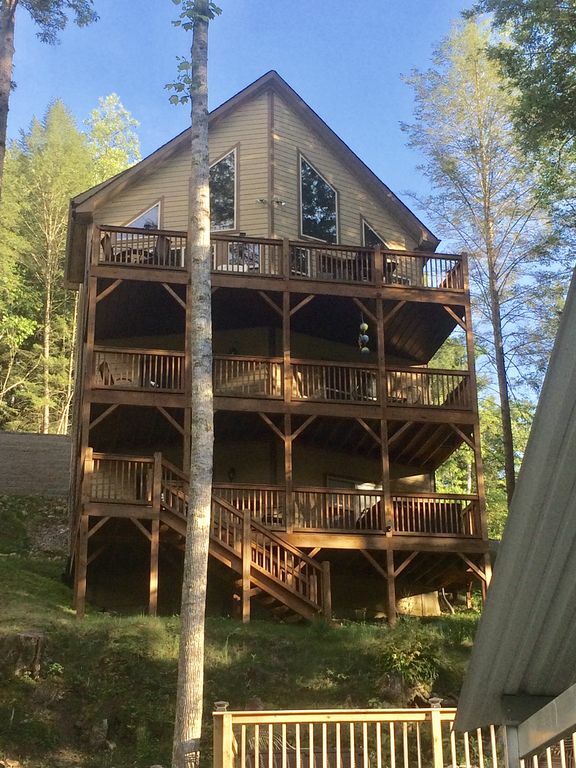 Fully loaded, luxury lakefront cabin located by famous "Jump'n Bridge"
Located in prestigious Lakeside Estates gated community, 'The Cove' cabin has everything for your vacation. Let the kids wakeboard/water-ski all day while you relax from one of the four lake-view decks. Or chill in your own 6-person personal hot-tub. ***The water is changed prior to your arrival***. Park your boats in the personal covered boat dock with 2 covered slips and 2 jet ski docks directly in front of your cabin. No boat? No worries! Nearby Norris Lake Watersports, Oasis Watersports, Sugar Hollow marina, Shanghai Resort offer daily/weekly boat rentals. The main level is right off the easy accessed parking area. The Main Level has the huge kitchen, huge great room, dining room, master suite, and deck overlooking the lake. Up one level you will find two bedrooms with private vanities and a jack-&-jill bathroom. Up another level finds one more bedroom great for the person(s) wanting isolation. The Lower Level has a recreation room equipped with another huge TV, billiards, foosball, two more bedrooms, laundry room, and another deck overlooking the lake. This deck is the ideal reading room. The Bottom Level has another TV room, two more bedrooms, and another deck overlooking the lake. Most importantly you will find a strategically placed spare refrigerator & ICE MACHINE on your way to the lake. Right outside is your private hot tub. At night share stories while making smores at your private fire pit. John Bertke lives in Dayton Ohio and enjoys visiting Norris with his friends and family. He enjoys fishing and smoking cigars. He took over management of this property in late 2017. They say 'location' means everything. "The Cove" cabin is 7 minutes from the city of Lafollette, 5 minutes from the main road, inside a gated community, right on the water's edge, and only a few yards from the boat ramp. I'm an avid fly fisher, my wife loves to golf, and my daughters never tire from wake surfing so my whole family stays happy when we visit Norris Lake. Jack-&-Jill bathroom between bedrooms 3 & 4. Full bathrooms on each of the main levels. 6 sets of bath towels provided for each bathroom. Bed linens including comforters, pillow cases, flat & fitted sheets. Plenty of parking for 5 vehicles directly in front of the cabin. Extra parking in boat storage area for trailers and extra vehicles. Great room on main level with dining room & kitchen. Lower level game room with TV, couches, chairs, billiards, foosball. 2 full refrigerators and a professional ICE machine. Huge kitchen supplied with evrything needed for the camp chef. We supply a kitchen inventory weeks prior to your arrival. A short 1/4 mile from the cabin up a very steep street. No added cost. No pass required. Exclusive >> we empty, clean, and provide fresh water 1 day prior to your arrival. "The Cove" at Norris Lake is the perfect place to gather with your friends and family with plenty of space and things to do. Please call us for suggestions on golf, boat rental, restaurants, bedroom details, etc. We are here to assist you. Cleaning fee includes bed linens and bath towels. Must be a minimum 28 years of age to rent this beautiful and well maintained cabin.